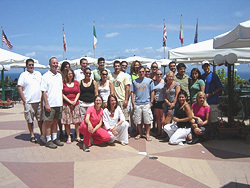 My name is Paula and I am an American student who has been studying in Sorrento for the last 4 weeks . I was looking for a great study abroad experience and this is the perfect example! 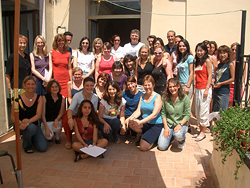 The school in Sorrento is a small school for students of all origins and age. I think that things like that are the best. 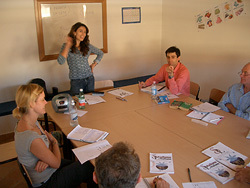 I have taken Italian classes with other people from the Netherlands, Austria, and Russia! Since I am here for the full semester, I have a concentrated Italian class with another student from America twice a week. In that class we learn grammar and verb tenses, things that will help us to communicate with the local Sorrentini. However my favorite class is definitely Italian conversation class, because that’s where I can put to test what I have learned in class. Wow! Everybody should go to Rome, at least once in your life, and I suppose a lot of people do go there. In fact, it was packed with tourists and just think, we are still in the throes of winter, and a really wet and damp winter it has been so far. I am sitting on a terrace watching the sun set over the hills above Sorrento. What could be more splendid? Well, the fact is that I am doing this after spending a fabulous day discovering how to prepare and cook delicious Mediterranean dishes and after tasting and enjoying the fruits of my labour. The word labour does not quite conjure up the delights of such a wonderful day! How did I end up here, sitting on a terrace, overlooking the Mediterranean….? You may ask! 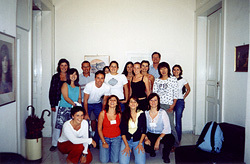 Well I am studying Italian language at an Italian language school in Sorrento. Not only do we study the language but the school has realized that in order for the language to come alive for its students, they need to touch, taste, feel, hear and see Italy outside of the classroom. This gastronomic experience is just one of the tours that the school organises for their students and if you ever come here – Don’t miss it! We are sitting on the terrace eating a fabulous pizza and catching a bit of sun. What a nice life! I can’t believe my colleagues, they come from all over the world to stay in one of the best places in the world. Well, when I say colleagues, we aren’t at work, we are studying Italian in what must be the best school in Italy! The school is in such a beautiful location, with sea views which simply inspire you to learn! The ‘pizza moment’ (a daily tradition for us!) 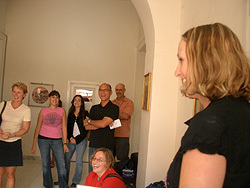 is such a good way to get to know the other students and create friendships that last even when the course has finished. What is more, here you can continue your lessons even when you have finished the course because it’s possible to have lessons on-line with the teacher of your choice, after you leave the course. So, when I am back home and am crying because I am no longer in Sorrento learning Italian, I can carry on with my studies and keep in touch with my colleagues,….. but and it is a BIG ‘but’, I won’t be able to buy the same pizza as the ones you can buy in Sorrento! But not only this, I am studying the Italian language in the best school in Sorrento. The school organises visits to ice cream factories as well as cookery courses to help us poor mortals knock up a decent pasta dish when we go back home..to mention just a few of the things on the activities programme… This is the ideal place to learn the language, but also all about the food and have a great time at the same time AND impress your friends with all that you have learnt once you get back to your own country… That is if you ever leave again! Different Cultures – Common Goals! Hi guys, I counted the number of different nationalities on my course today and I was amazed! This week there are people from America, Australia, Austria, Belgium, Britain, Germany, The Netherlands, Iceland, Scotland and Russia and they are all learning Italian! What a great way to learn a language, we go out, we socialize, we eat in nice restaurants and we all communicate with each other in our new language. Ok, now and again I use my English to help along my Italian, but being part of an international community makes you want to speak Italian. And then of course, there are lots of Italian people who are only too willing to listen to you while you try to get your message across. Living the good life in Sorrento! The sun is shining and I’m sitting on my school’s glorious sun terrace….! There are tables and chairs outside so the students can sit in the sun or have lunch or a chat before or after the lessons. My school is soooo organized! !… It doesn’t just give you Italian Lessons, it really does everything to help make your stay in Sorrento an amazing experience! The staff are always on hand to help you, but I must say that staying in Sorrento is usually a trouble free experience as there is hardly any crime and the people of the town are friendly and helpful. But my school has made such a difference to my stay, they have organized pizza parties for myself and other students, they take us on tours of Sorrento and the surroundings and explain the location and its history. We also have organized evenings out with the other students for a real fun way of getting to know other people from all over the world. Hi all, you know when you experience something so different from what you are used to that it leaves a lasting impression on you and makes you think about life? Well, that is just what happened to us when we went to the Easter Processions that take place in Sorrento and along its coastline. It was a fantastic, moving and thought provoking night. 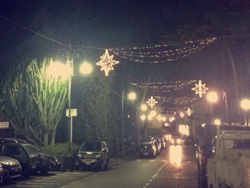 It starts in Sorrento on Thursday night when many people of the town form a procession which moves through the town along with a statue of the Madonna, all people are dressed in white, symbolizing life. I think you have to be there to feel the energy and the beauty of the procession because it sure is difficult to describe! There was another procession the following night and for me these two nights really made my Easter meaningful ….and not just about eating loads of chocolate and cake! Mind you, eating loads of chocolate and cake isn’t a bad pastime and in Sorrento – You are spoilt for choice for delicacies like Baba’ ( a cake soaked in rum,), ice-cream, lemon cakes and crepes. 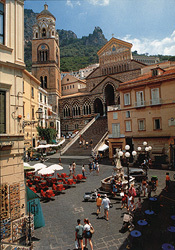 Sorrento and its Dolce Vita is just right for me! Taking it easy in Sorrento! The weather is definitely better here than when I left UK! I’m in Sorrento at the moment, after travelling around Italy for a while and its such a cool place, I have decided to stay here for a while. My American friend was doing an Italian language course at a language school in Sorrento and she convinced me that as we both want to stay in this fair country, we might as well use our time to learn some of its language! I think I will also get a job, so I don’t have to go home for a time. But as I would like to be able to order a cappuccino at a bar, buy a pair of jeans in the great shops here, get on the bus to Positano and talk to some Italian guys, I agreed with my friend that it was about time we throw our well thumbed phrase books in the bin and start some lessons!